These are my go to treat, since they are low in sugar (depending on how much syrup you decide to put on them), low in fat, high in protein and high in fiber (and gluten free)! They taste like a GIANT oatmeal cookie! Crunchy on the outside and fluffy on the inside! **Sometimes I will add a little syrup to the mixture and not top it with anything. It is a tasty treat that way too and you can eat it on the go! I am entering this into The Gluten Free Homemaker's Wednesday Carnival. I just had waffles for breakfast....have a great day! I could definitely see you as the owner of a gourmet waffle shop! gosh, I really wish we lived closer. I might have you teach me how to make waffles that good! I love that you love waffles! I would go for a waffle over a pancake and I think it's the crunch you get from waffles. And very cool on entering into that contest. I just checked out the site and sent link to my sister for recipes. yum, i love how simple this recipe is. thanks you for sharing. 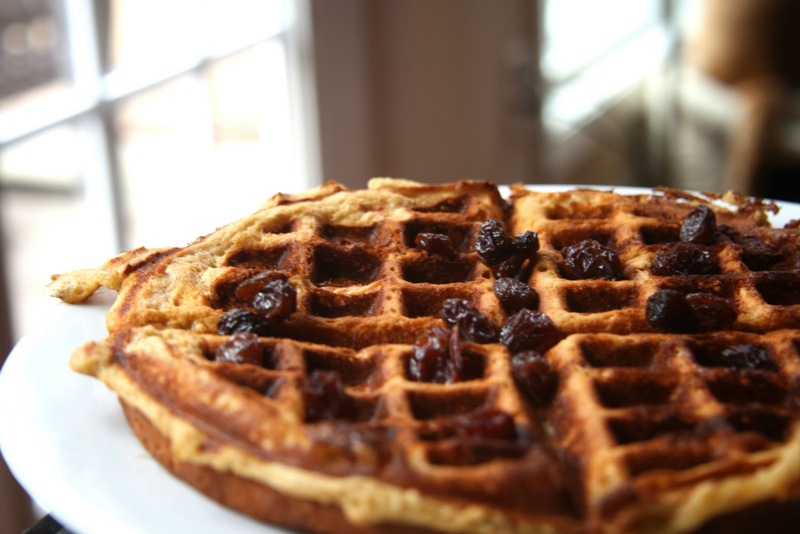 I love waffles, but I've never tried anything like this recipe. It looks delicious! I love the effort you put into even your snacks. This looks amazing! Yum! I'm always looking for new healthy waffle recipes---I think I love waffles more than cookies! Thanks for the recipe. I'm going to try this one next. I am a pancake girl at heart, but I love eating waffles because of the nooks and crannies... perfect hiding spots for peanut butter! this is 100% a recipe that you know is going to be good just by reading the name of it. the dripping syrup just adds to its splendor! I love waffles and oatmeal raisin cookies! And I'm so glad I can make these with So Delicious coconut milk. It's the only "milk" we have at our house! Do you think almond flour would work for this recipe? Just found your blog!! and wow.. these waffles LOOK WONDERFUL. Cant wait to look through the rest of your recipes!! :) I also write a blog- that is all dairy free (and gluten free) So Its always fun finding like minded bloggers!! Yum! I love waffles, way better than pancakes in my opinion. I'd never thought of putting raisins in waffles. Looks great! Nina, I think it would work. If you try it, let me know! 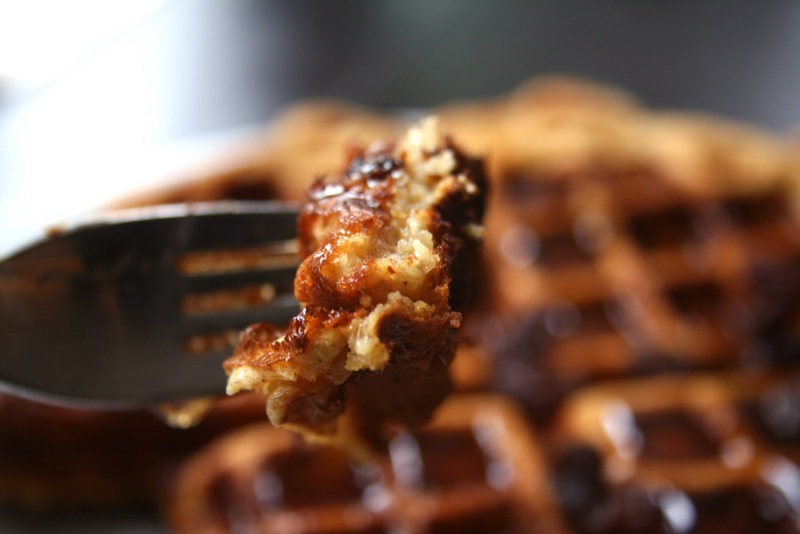 I really need to "borrow" my mom's waffle maker so i can make these. As if I didn't want a waffle maker enough already! Those look so good. That's it - I'm buying one this weekend!! I'd have to say every Sunday I wake up and say "Lets have pancakes or belgium waffles" haha-I never feel good after I eat them, but while eating them...i'm in heaven! These are awesome! Thanks for the recipe :) My kids and I loved them, can't wait to try them on the weekend when my husband can have them too. Delicious! I adore waffles! I think this post has convinced me that I need to start making them more often (at least more frequently than once every 5 years! ), thanks for a great recipe! i'm so tempted to get a waffle maker - but i know it would just clutter the counter....so i'll just let the restaurants take care of my cravings! 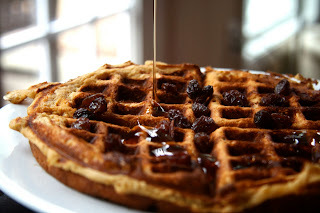 MMMMMMMMMMMMMMM,..ypur gf waffles look delightful!! Cool pictures too! Real comfort & good for you food! Peanuts...Get Your Fresh Roasted Peanuts!